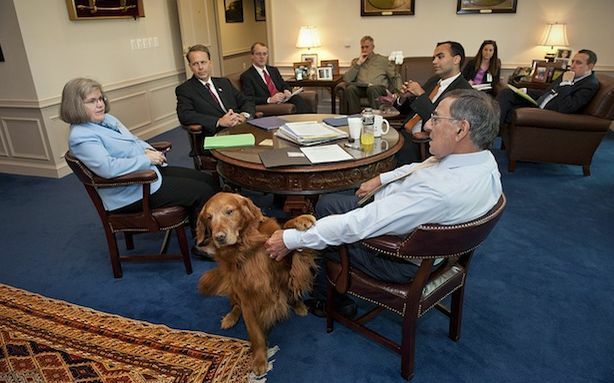 Defense Secretary Leon Panetta owns a golden retriever — code name: Bravo; real name: Bravo — who, besides witnessing first-paw the CIA’s plans to hunt down Osama bin Laden, is way better at keeping secrets than disgraced former CIA chief David Petraeus, reports Bloomberg. That’s not just because Bravo can’t speak because Bravo is a dog. Indeed, Bravo is capable of literally sniffing out other leakers. 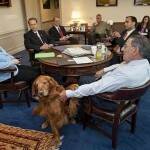 Speaking of leaks, a touchy subject here at the Pentagon, Panetta joked that Bravo was there to sniff them out. In fact, Bravo did take a moment to study the shoes of CBS’ esteemed Pentagon reporter David Martin. Nothing to see, or smell here. This entry was posted on Thursday, December 20th, 2012 at 7:55 pm	and is filed under Dogs. You can follow any responses to this entry through the RSS 2.0 feed. You can leave a response, or trackback from your own site.